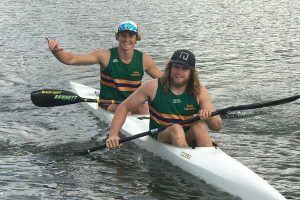 Congratulations to Fletcher Armstrong in Year 10 and Byron Chadwick in Year 12 who achieved outstanding results at the recent Australian Canoeing National Championships held at the International Regatta Centre in Penrith. Fletcher Armstrong won the Under 16 K1 1000 m, 500 m and 2.5 km; the Under 16 K2 1000 m, 500 m and 200 m; as well as the Under 16 K4 1000 and 200 m. With eight gold medals, he was selected in the Under 16 Australian Sprint Kayak team to compete at the Asia Pacific Championships in Adelaide in May. Byron Chadwick won the Under 18 K2 1000 m and 500 m; the Under 18 K4 1000 m and 500 m. He was selected in the Under 18 Australian Sprint Kayak team to compete at the Asia Pacific Championships in Adelaide in May and the Under 18 Junior Worlds team to travel to Bulgari. Exceptional results from two very talented young sportsmen, we wish them well in the upcoming Championships. Byron is pictured with Old Boy, Harry Armstrong who also achieved outstanding results winning the Under 18 K1 1000 and 500m; the Under 18 K2 1000 and 500m; the Under 18 K4 1000 and 500m. 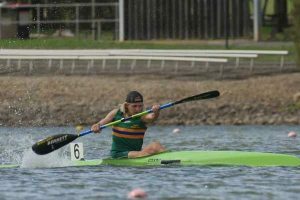 He was also selected in the Under 18 Australian Sprint Kayak team to compete at the Asia Pacific Championships in Adelaide in May and the Under 18 Junior Worlds team to travel to Bulgaria in July.